Despite backchannels, tinfoil rooms, and shadow cabinets, President Trump’s “satellites” still manage to leave all the evidence on the internet. The Ukraine-to-Russia backchannel was falling apart. It was February 2017, and the public had just begun to reel from the revelation that newly-appointed National Security Advisor Michael Flynn was caught on intercepts negotiating sanctions with a Russian official. Despite DOJ warnings that the former-DNI head was likely compromised, the White House was revealed to have done nothing to act. And worst of all for the Trump Administration, the existence of a secret “Peace Plan” for Crimea had been leaked, outing the parties involved — Felix Sater, Michael Cohen, and Ukrainian politician Andrei Artemenko. A new “phone line” was needed. Giuliani had been named President Trump’s “informal” Cybersecurity Advisor in January 2017. The role was somewhat of a concession after Giuliani withdrew his name from consideration for Secretary of State amid reports of his foreign conflicts-of-interest. In interviews, Giuliani claimed he would advise Trump on private sector solutions to enhance the country’s cyber defenses. In reality, Giuliani’s role was meant to facilitate the admin’s covert domestic cyber operations and to reorganize and privatize U.S. cybersecurity. Guiliani was now being asked to do something else. Sometime between February and April 2017, Guiliani entered into a “cybersecurity contract” with the city of Kharkiv, Ukraine. By June, he had also landed a “cybersecurity contract” with the city of Kiev. Throughout 2017 and 2018, Giuliani and his team traveled back and forth to Ukraine as related developments in US foreign policy, US cyber policy, and the Special Counsel investigation unfolded. The new backchannel arrangement was facilitated by Russian-Ukrainian-linked firm Tri-Global Strategic Ventures (TGSV). Giuliani first met Russian Foreign Minister Sergey Lavrov when he partnered with TGSV for a project in 2004. 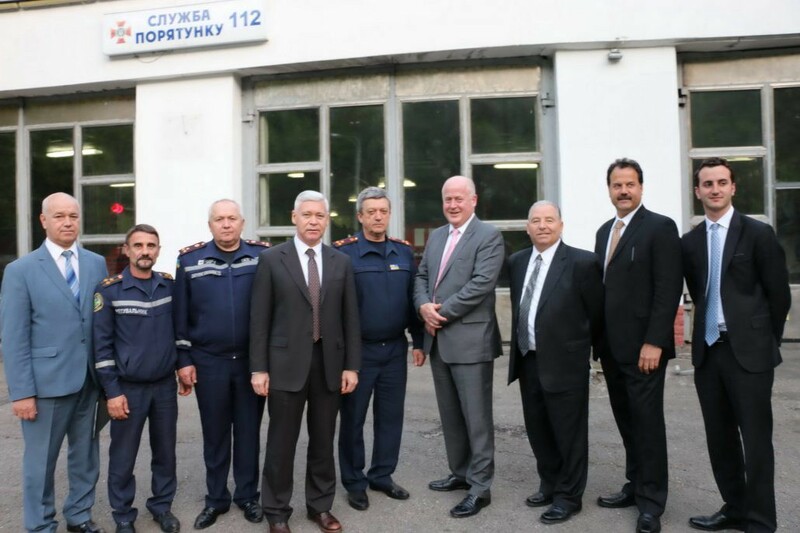 By late April of 2017, the deal between Giuliani’s private security firm Giuliani Security and Safety LLC (GSS) and Mayor of Kharkiv Gennadiy Kernes had kicked off. 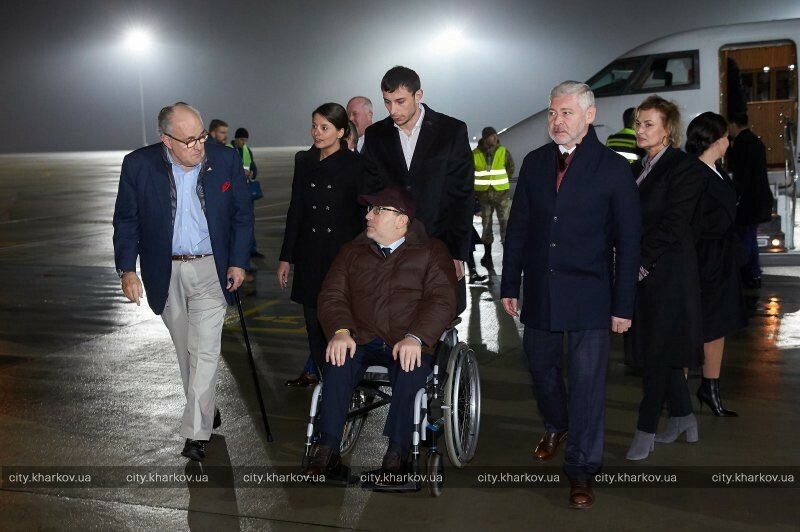 Sometime around May 2, Giuliani’s team arrived in Kharkiv for in-person meetings (ed note: unsecured link). As Giuliani’s team was on the ground in Kharkiv for over a one week visit, Trump was hunkered down at Bedminster over the weekend of May 6 and 7 with son-in-law Jared Kushner, daughter Ivanka Trump, and speechwriter Stephen Miller. It would later be reported that the entire weekend was consumed by the group’s “plotting” to fire FBI Director James Comey. It would also later be revealed that the Bedminster estate was fitted with a “tinfoil room”. Two days later, on May 9, Comey learned that he had been fired via a cable news crawl while giving a talk in Los Angeles. Over this same week-long period, travel plans for meetings at the White House where being arranged with Russian Foreign Minister Sergey Lavrov, Russian Ambassador Sergey Kislyak, Ukranian Foreign Minister Pavlo Klimkin, and Cybersecurity Advisor Rudy Giuliani. This can be inferred by the fact that all three were in D.C. on May 9 and attended White House meetings the following day, May 10. 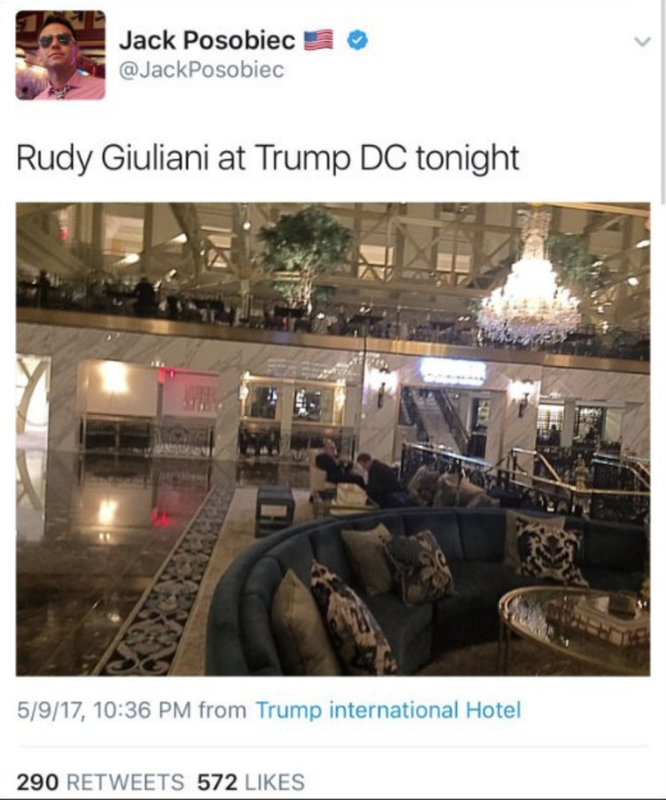 Giuliani, in fact, was spotted on an Amtrak train headed to D.C. at 3:38 EST on the 9th and photographed later that night alongside Jack Posobiec’s wife at the Trump International Hotel. 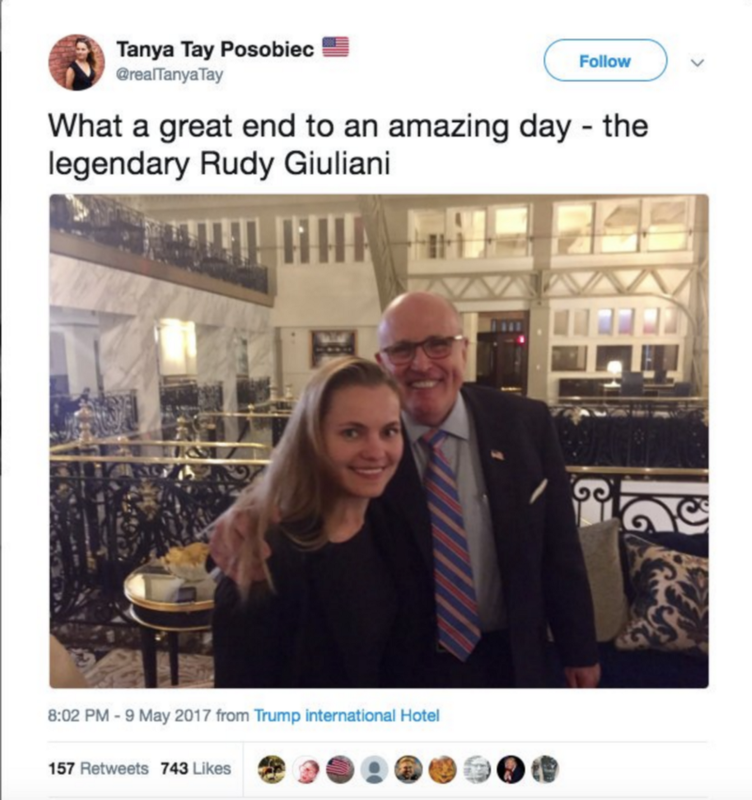 It is unknown whether Giuliani and Lavrov, who had an existing relationship via TGSV, met or communicated the night of May 9th. However, Giuliani’s firm did seem to signal that the deal was a go. 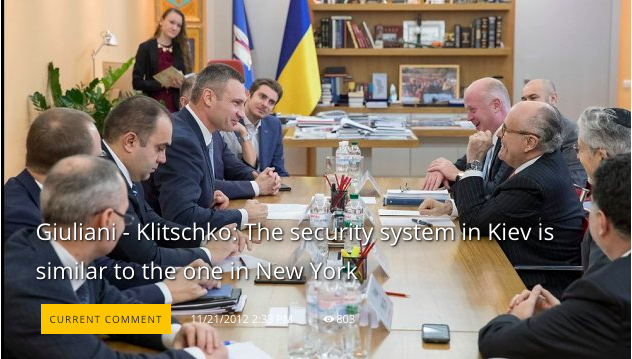 An announcement of the Kharkiv “cybersecurity contract” was posted on his security company website alongside pictures of their meeting (ed note: unsecured link). The events of the day following Comey’s firing, May 10, are now the subject of intense scrutiny by Mueller’s team. President Trump infamously hosted Foreign Minister Lavrov and Ambassador Kislyak in the Oval Office, handing over top-secret intelligence among other alarming actions. Giuliani and Ukraine’s involvement in these events has never been reported. Ukrainian Foreign Minister Klimkin was at the White House to meet Vice President Mike Pence the same day the Russians and Giuliani were there. Klimkin was then escorted by Pence to the Oval Office, where he stood for a photo op alongside a seated Trump. 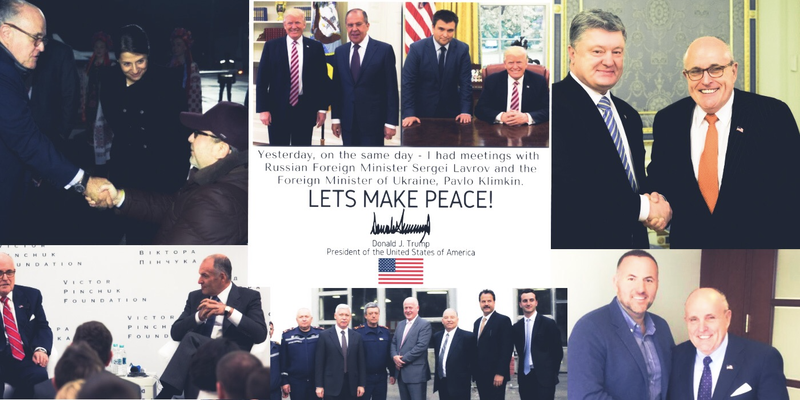 In Ukraine, Andrei Artemenko reportedly “caused a spectacle” over the photo, alleging Poroshenko had paid Trump a $400,000 bribe. A year later, that bribe would be reported by Paul Wood, whose single Ukrainian intel source alleged the bribe had been paid to Cohen. 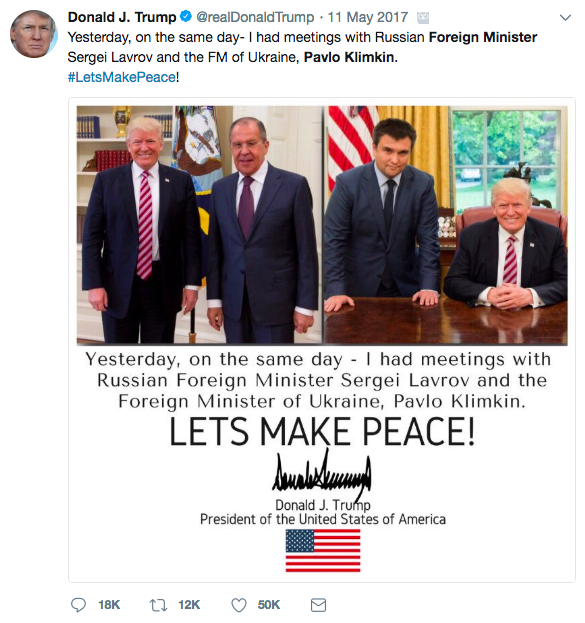 The following day, on May 11, President Trump tweeted a side-by-side image of him with both Foreign Minister Lavrov and Foreign Minister Klimkin. He included the message “Let’s make peace!”. Also that day, then-Homeland Security Advisor Tom Bossert announced the administration’s first Executive Order on Cybersecurity. During the press conference, Bossert made a point of thanking Rudy Giuliani for his contribution to the new policy. Three weeks after Comey’s firing, Giuliani traveled to Kiev in June 2017. 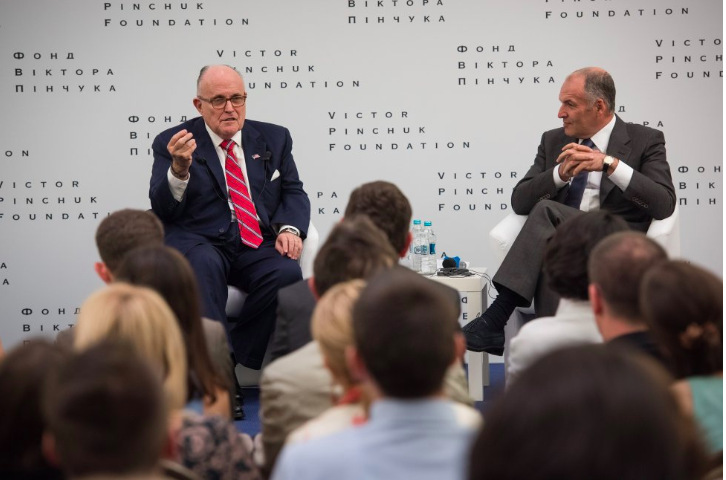 Trump’s Cybersecurity Advisor gave a talk on “Global Challenges, the Role of the US and the Place of Ukraine” at the Victor Pinchuk Foundation (VPF) on June 7. Pinchuk is reportedly under investigation by Mueller for a $150,000 donation to the Trump Organization in 2015. During his talk and in media interviews, Giuliani represented himself as an advisor to the President. 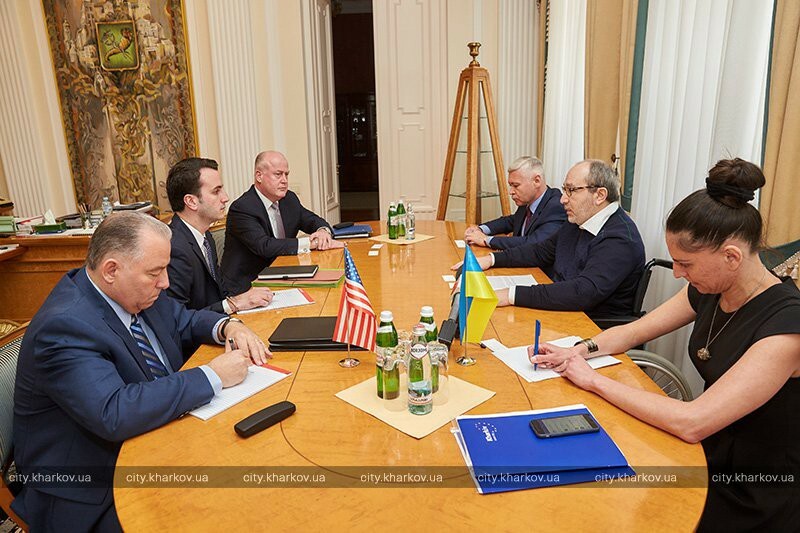 According to VPF’s blog, Giuliani also met with Ukrainian government leaders in Kiev during the visit. This included President Petro Poroshenko, Foreign Minister Klimkin, and Kiev Mayor Vitali Klitschko, with whom he kicked off a separate “cybersecurity contract”. As Giuliani’s work with Ukraine continued through 2017 and 2018, two alarming timelines emerged. First, on the cybersecurity track, major events relating to U.S. domestic and foreign policy unfolded alongside GSS’s travel to Ukraine. 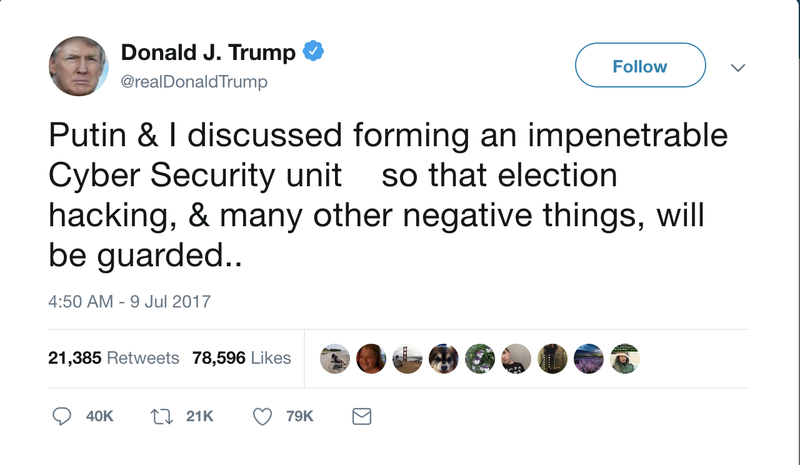 This included Trump’s post-G20 announcement of a “Joint Cybersecurity Task Force” and the State Department elimination of their Office for Cyber Issues in July 2017. On the arms deal track, negotiations between Ukraine and the U.S. coincided with GSS’s Ukraine visits and Special Counsel developments. With Paul Manafort’s indictment just announced, Giuliani’s traveled to Kharkiv in November 2017 on the private jet of Alexander Rovt. Rovt is reportedly under investigation by Mueller for a post-campaign loan to Manafort. 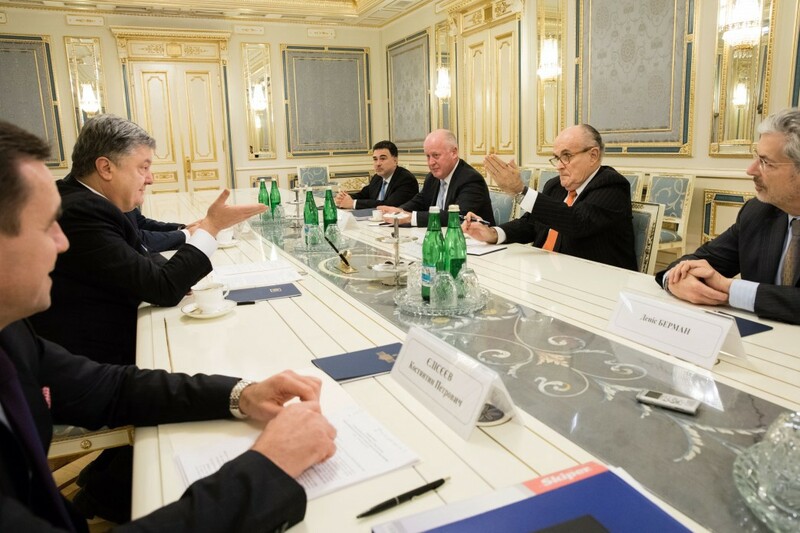 After Giuliani’s meeting in Kharkiv, he traveled on to Kiev to meet again with Poroshenko. Unlike their previous meeting in June, this was a formal engagement that was publicized by Poroshenko and reported broadly in Ukrainian media. The November 2017 meeting between Giuliani and Poroshenko occurred just one week after a long-sought lethal arms package was approved to present to Ukraine — a deal Trump had previously been “stalling”. According to reports, the Ukrainians discontinued cooperation with Mueller’s investigation shortly thereafter. Officials who were expected to meet with Mueller in November and December never showed. 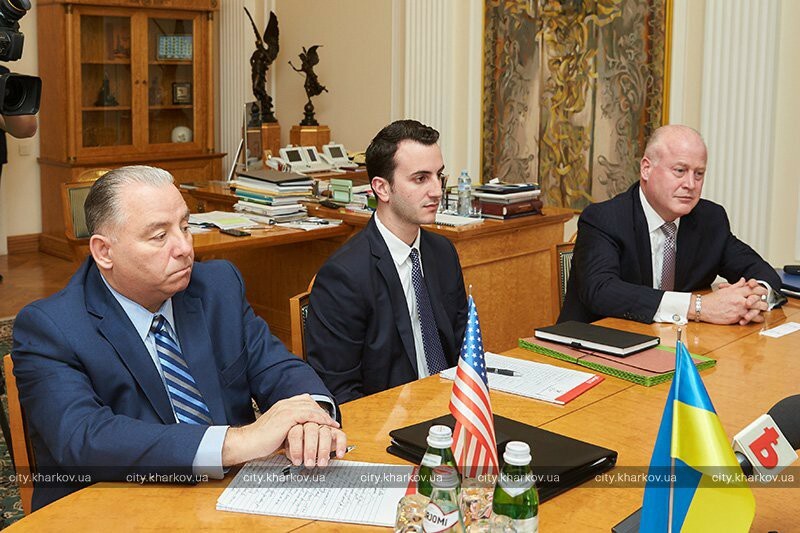 In April 2018 — shortly after a delegation for Kharkiv met with Giuliani in New York City and provided tours of the state’s emergency management offices — Poroshenko confirmed the arrival of Ukraine’s Javelin missiles. These are but a few examples of the covert backchannel negotiations Giuliani has facilitated with foreign governments over the past two years. His effort to reorganize and privatize U.S. cybersecurity appears to have been realized this past November, as President Trump signed into law the Cybersecurity and Infrastructure Security Act (CISA). The new agency was announced just days after Trump and thirty GOP congress members returned from clandestine meetings in Paris against the backdrop of the 100th anniversary of the WWI armistice. Trump left that gathering a day early, opting not to sign on to the Paris Call For Trust and Security in Cyberspace alongside fifty-one other democracies. Upon their return, the GOP Senate opted not to impose it’s next planned round of Russian sanctions. More on Giuliani's role can be read here, here, and here. These are not facts the mainstream media unaware of but have thus far opted not to report. Yet, they continue to provide Giuliani with a limitless platform for disinformation while using him as an anonymous source for Mueller “scoops”. In September 2018, seven Senate Democrats sent a letter to the DOJ to request an investigation of Giuliani’s Ukraine work. The status of that request remains unknown and unreported.